A few nights ago we were thrilled to attend a beer pairing dinner featuring Avery Brewing Co. at The Watermark in downtown Baton Rouge. I have had a couple of Avery Brewing’s beers and have always been impressed by the quality and creativity of the brewery. The Boulder, CO based brewery opened in 1993 and boasts 30 beers on tap at their brewery at any given time. For the tasting we were seated in the private dining room adjacent to The Gregory. I know this post is all about Avery Brewing and our wonderful dinner, but I just have to say one thing: THAT ROOM! I drool every time I walk by that beautiful room and it’s floor to ceiling wine cellar display. If you haven’t walked around The Watermark and The Gregory, I highly recommend the trip downtown. The amount of detail and nods to Louisiana Trust & Savings Bank headquarters (the original owners of the building) is very impressive. There’s hand-painted ceiling murals and gorgeous marble details throughout the building. Not to mention the old bank vault replicas adorning one of their meeting spaces. 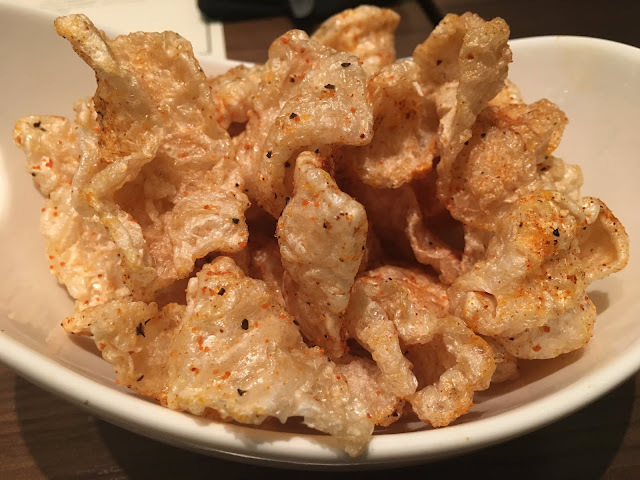 To start off, the tables were decorated with bowls of fried pork rinds tossed in Jay D’s Spicy and Sweet BBQ Rub. Needless to say, we loved them and ate them all and can’t wait to make our own. The first course was a yellowtail tiradito paired with a Raspberry Sour. This delicate dish of thinly sliced raw fish in a spicy sauce was bursting with flavor. Chef made his own beer vinegar from the Avery Brewing Raspberry Sour that added a fun element to the depth of flavors. The next course was a first for me, octopus tacos! I was unsure how the flavors would mesh but the combination of octopus, peach and blue cheese was surprisingly delicious; and it’s pretty fun to say “octo taco” (don’t be ashamed, give it a try). 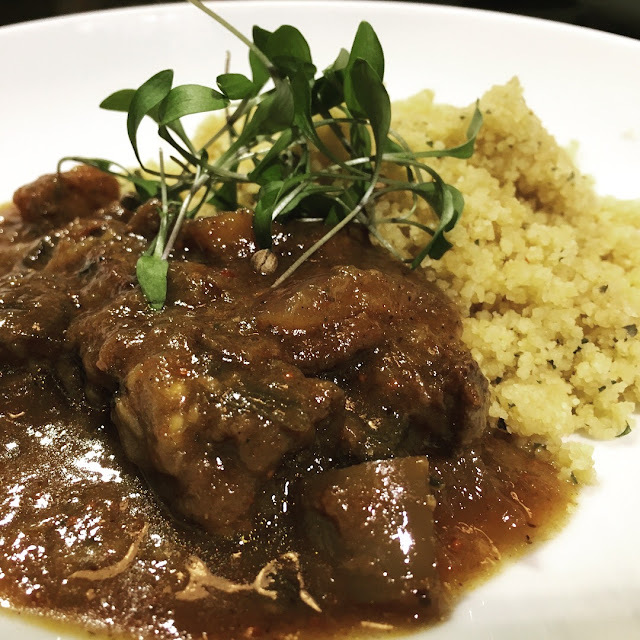 This dish was paired with Avery Brewing’s Liliko'i Kepolo, a fun tropical island twist to the spicy traditional witbier. 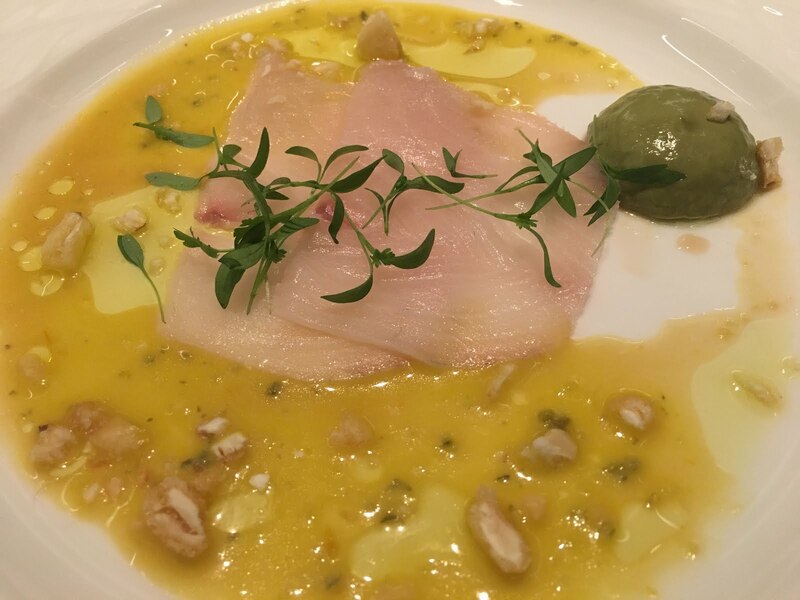 The aroma and notes of passionfruit were a nice compliment to this funky dish. 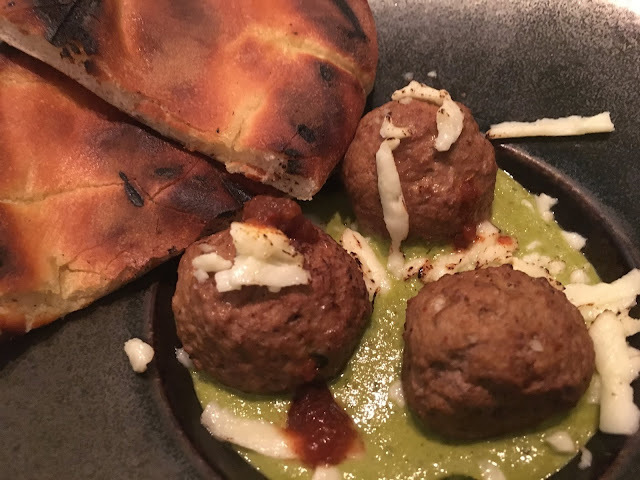 For the third course, chef came out with bowls of green harissa topped with beer poached meatballs. The real show stopper of this dish was the mint chutney. 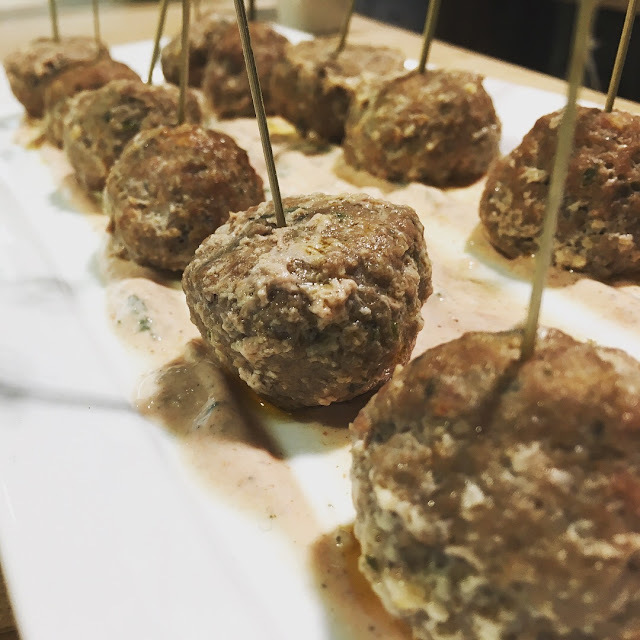 The lamb sausage blend of the meatballs with the mint chutney was so satisfying and a nod to growing up with a mother who regularly cooked lamb roasts topped with a delicate mint jelly. The best. For the main course, we were brought a beautiful twist on the traditional lomo saltado. This traditional Peruvian dish combines marinated strips of sirloin with onions, tomatoes, french fries, and is typically served with rice. We were served a thick and buttery cut of seared beef over a bed of popcorn rice with purple frites as a fun compliment on the side. The main dish was paired with The White Rascal, Avery Brewing’s flagship beer. The Belgian style white ale is unfiltered and spiced with coriander and Curaçao orange peel, producing a refreshing classic ale. The dessert course was certainly the most aesthetically pleasing. The beer-misu came decorated to look like a frothy beer. It was too cute. 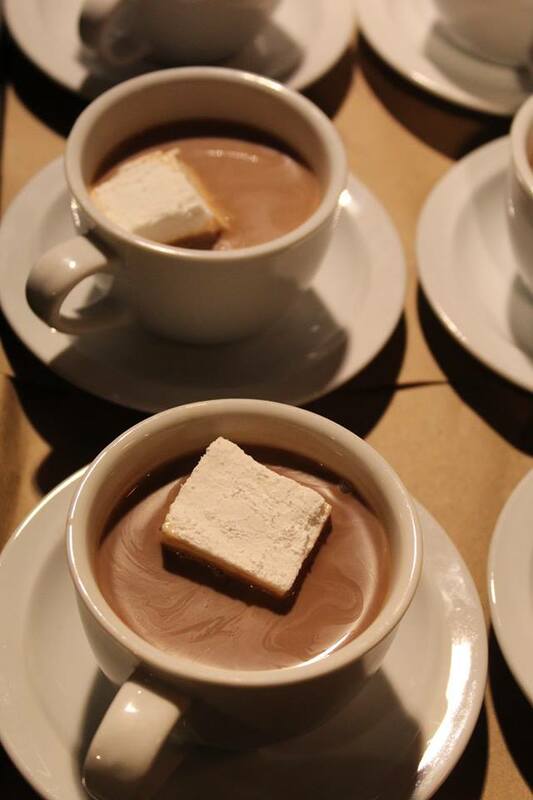 The rich hazelnut chocolate with mascarpone cream was the perfect mate for Avery’s Vanilla Bean Stout. It was a heavy dessert but too good to put down. 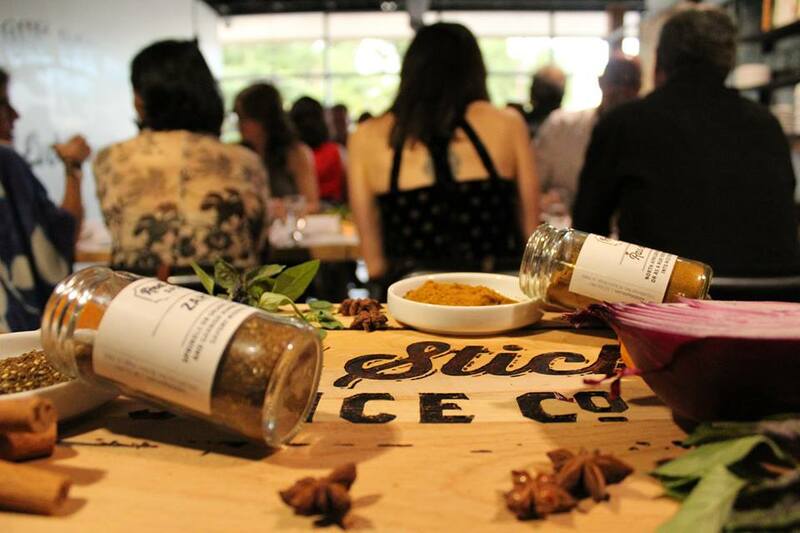 Thanks to The Watermark for inviting us to this impressive beer pairing dinner. We can’t wait to see what they will come up with next. Check their Facebook for upcoming culinary events, you won’t be disappointed! So, we are doing a thing. A very big thing. 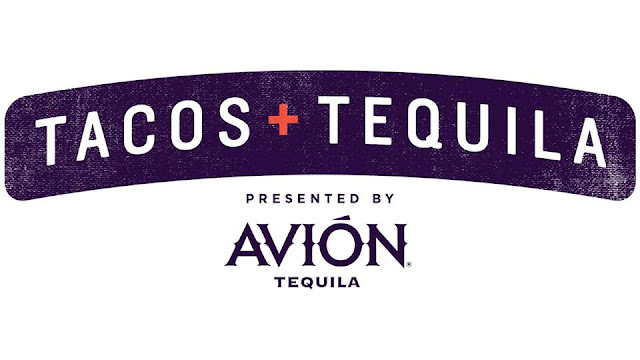 On a mission to bring the people of Baton Rouge a good time, Bite & Booze is teaming up with Brickyard South to throw a major party in the Capital City: TACOS + TEQUILA presented by Tequila Avion! The event will take place underneath the I-10 Mississippi River Bridge behind Brickyard South. There are going to be ten taco vendors and at least seven tequila cocktail vendors, duking it out for the title of “The Best.” Restaurants like Magpie Cafe, The Overpass Merchant and Mestizo’s will be slinging some majorly creative tacos that we can’t wait to see. 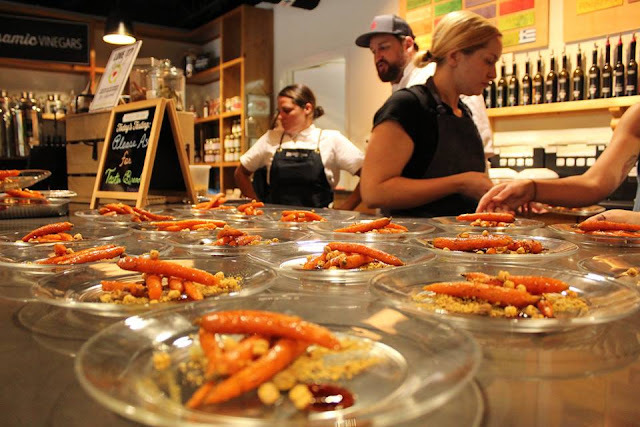 There will also be a few restaurants going the traditional route like Cocha and Mr. Taco. We are inviting judges from all over the country to see the best of the best talent here in BR. People like Rue Rusike and Cory Bahr from Food Network Star, Daniel Schumaker, the editor of Louisiana Cookin’ Magazine are all coming to the capital city this Friday. 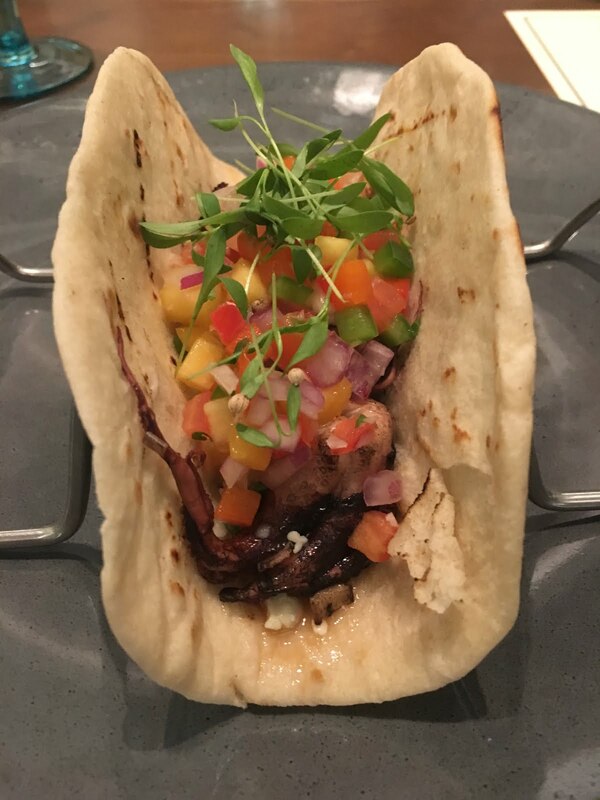 Once the judging is over, attendees will have the chance to walk around from 7pm-10pm and sample and vote for their favorite chef-driven tacos featuring Hola Nola Foods tortillas and hand-crafted Tequila Avion cocktails while enjoying live music and other fun! That’s all the tacos you can eat and all the tequila you can drink people. Taco bout a good time! So, what are you waiting for? Grab you tickets now and come hang out with us on Friday. We will see you there! Good morning everyone, and welcome to another beautiful gameday edition of #wakeywhiskey! This round I'll be getting into some scotch courtesy of the good people at Laphroaig. Usually I try to find a connection between the occasion and the whisk(e)y I choose to sip on in the morning, but LSU is playing at Mississippi State and I don't have any spirits from Mississippi in the collection. Honestly, I don't even know if there are any legal distilleries in the state. With that being said, Jay was generous enough to share a sample from Laphroaig with me, and of course I saved some for gameday morning. Laphroaig's distillery was founded over 200 years ago in 1815 on the island of Islay in Scotland. Islay is known for peaty whiskys overall, although not all Islay whiskys are heavily peated. It's a small island with just over 3,000 residents, but they boast 8 distilleries (with more on the way) and even one brewery, Islay Ales! Laphroaig is situated on the southern coast of the island, about a mile from the Lagavulin distillery, which is less than a mile from the Ardbeg distillery... and those are just three. That's it, I'm putting Islay on my bucket list. This particular sample from Laphroaig is their Cairdeas 2017 Cask Strength Quarter Cask Edition, clocking in at a robust 57.2% abv. 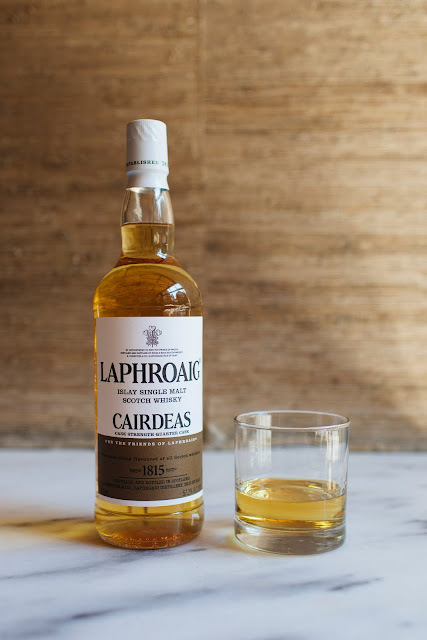 At first I thought that Cairdeas must be some sort of wine that contributed their barrels to this aging, but upon further investigation I learned that Cairdeas is the Gaelic word for "friendship" and this is a special release for the Friends of Laphroaig members. See, you're never too old to learn something new! The whisky is actually aged in first-use bourbon barrels for 5+ years and then finished off for 6 months in American oak quarter casks prior to bottling at cask strength with only simple barrier filtration. Alright then, let's get into it! My first thought on the nose is that this is a crazy smokey scotch, with a touch of peat and bit of honey sweetness. The flavors are all bold and powerful, and there's an unmistakable burn from the alcohol content, but not as much as I would expect from a 114.4 proof spirit. 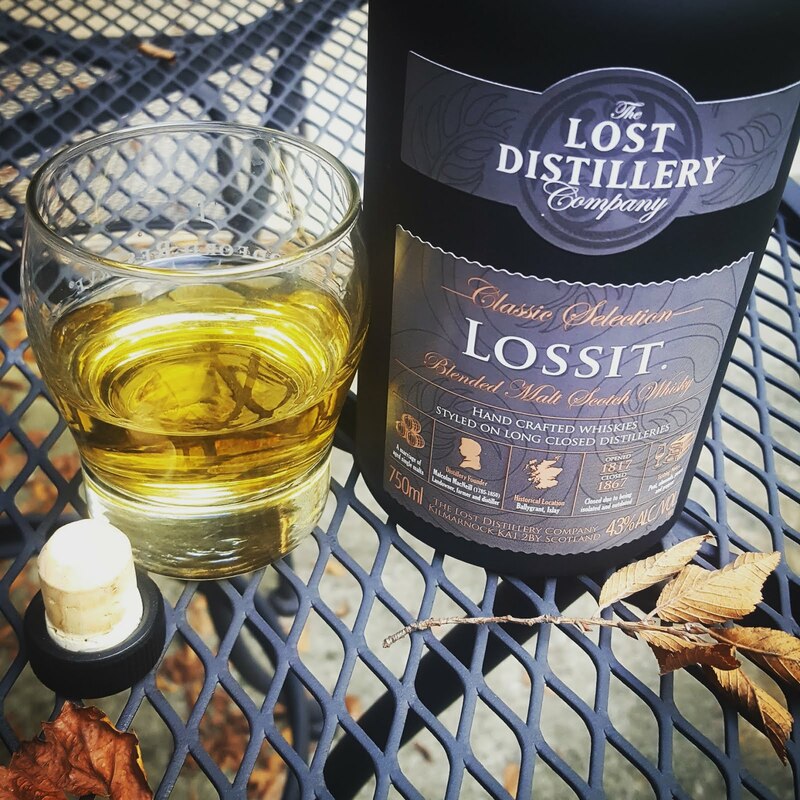 The taste is the same, with a lot of smoke and char, a little bit of peat, and followed by some more subtle sweet tones of honey and vanilla and a bit of a mineral water finish. After giving it a try neat I added an ice sphere to finish out the pour and that really helped the flavors mellow out and blend together without losing the essence of the spirit. The smokey notes still shine but more of the sweetness and oak character break through. Overall, a fantastic pour, and it even further cements my desire to spend a few days touring the island of Islay. Now, as I recover from this powerful scotch, it's gameday! Geaux Tigers! 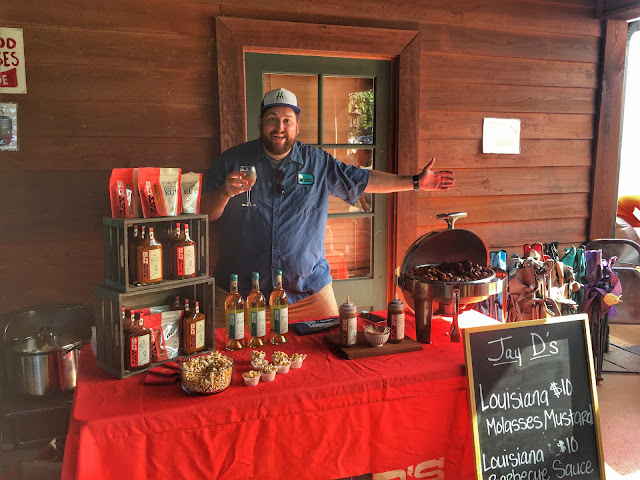 In honor of Louisiana Wine Month I wanted to reflect and share about the wonderful experience I had visiting Landry Vineyards. 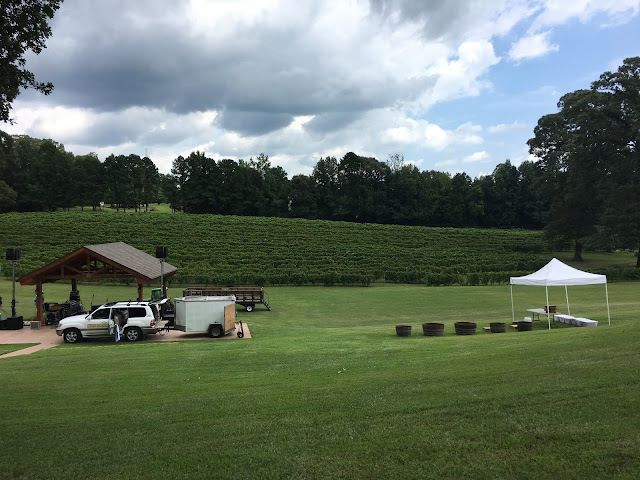 A few weeks ago, Jay and I headed out to West Monroe for the grape stomp and concert at the Louisiana winery and to celebrate the new vintage of Jay D’s Blanc Du Bois being bottled and ready for release. En route, we needed a brief stop for lunch and found ourselves at The Camp in Natchez, MS. This cool waterfront restaurant is an obvious favorite with the locals. On a beautiful Saturday afternoon people were congregating on the patio and stopping in for a cold one after a morning run or bike ride along the water. Two burgers and a cold beer later, we were prepared to make the rest of our journey to the rolling hills of West Monroe. Upon arrival, I literally felt as though I had been transported out of Louisiana and dropped somewhere in Texas Hill Country. Lush green pastures and elevation that towered higher than the Indian Mounds on LSU’s campus...how could this be? As we pulled in, Jay pointed out Jeff Landry, the owner of the vineyard, manicuring the area around the stage in preparation for his guests to arrive. Drenched in sweat and covered in dirt, this man was obviously not afraid to get his hands dirty. After having a few days to sit and visit with Jeff and his family, it is apparent that hard work and belief in Louisiana agriculture is what has propelled this vineyard to the success they are seeing today. They truly care about the land, value a hard day's work and their product speaks to all of those truths. Jeff, Libby and their four sons; Ethan, Kohen, Noah and Micah are the backbone of the business and have continued to grow thanks to the great support of friends in the Monroe area. The first vineyard started in Folsom, LA with two acres of a white European American hybrid grape, Blanc Du Bois. After the devastation of Hurricane Katrina, the Landrys relocated to the beautiful hill country of West Monroe, LA. The vineyard has now grown to a 20-acre site including a new winery and beautiful tasting room. Concert days are no joke at the vineyard. Hundreds of people come from the surrounding areas with blankets, chairs and picnics packed ready to purchase bottles of wine to be enjoyed right on the vineyard property. Jay and I set up a small tasting booth that featured our Jay D’s Spicy and Sweet BBQ Rub popcorn and sausage sauteed for guests to grab and dip into our Louisiana Barbecue Sauce and Molasses Mustard. We were so happy to be out there and mingle with everyone and experience the thrill that is a Saturday evening at Landry Vineyards. If you have never been out to the vineyard, I highly recommend the journey on a Saturday afternoon with friends and family. They have tractors rigged up with trailers and benches for vineyard tours, tastings of all of their different varietals set up in the pagoda and live music echoing from the stage nestled right at the base of the hill rolling down to the vineyard. It was the perfect summer evening to relax, listen to music and enjoy the bounty that this family has worked so hard to produce. You can find Jay D’s Blanc Du Bois at most of your local supermarkets. We are proud to partner with a local vineyard supporting Louisiana agriculture. Good morning on this #wakeywhiskey gameday! Now, we all know LSU put on a defensive clinic last week, so the easy choice here would be to go back to the well and stick with the same whiskey, right? You're right, that would be easy. However, LSU was supposed to beat BYU and I'm not a superstitious person. So, since LSU is playing Chattanooga, I checked the liquor cabinet for Tennessee whiskeys. I didn't have any Jack Daniel's... but I did have some Prichard's, both the Double Chocolate Bourbon and the Lincoln County Lightning. I've been enjoying some white "moonshine" styled whiskeys lately, so I opted for the Lincoln County Lightning. Prichard's opened in 1997, which is much younger than the established distilleries in Kentucky, Tennessee, and elsewhere, but still relatively old in the current era of craft spirits. They currently produce multiple types of rum, whiskey, and liqueur in two locations within the state. 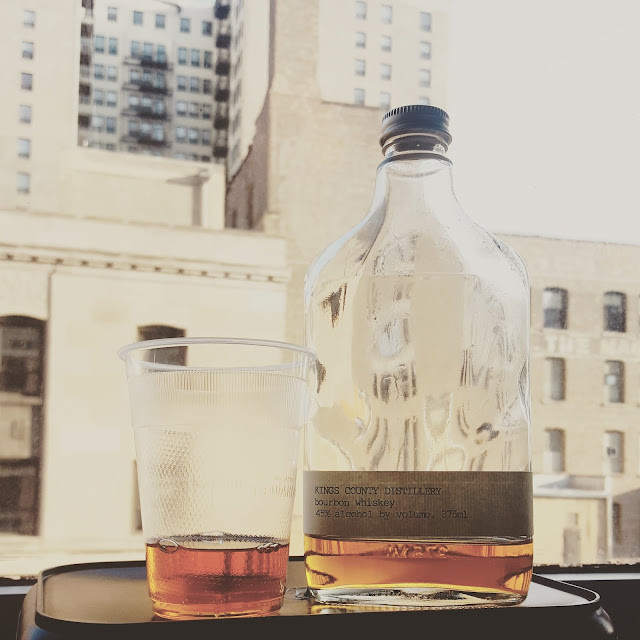 Two of my last three #wakeywhiskey posts have featured white whiskey, and in both cases I really enjoyed the spirits. 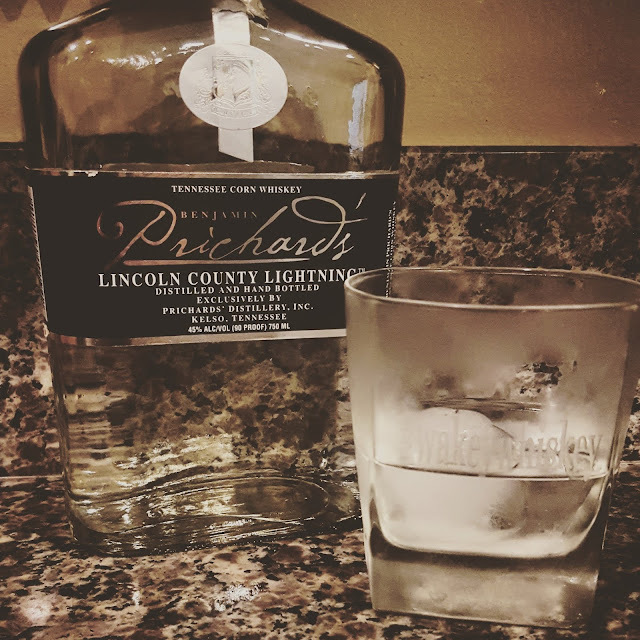 This Prichard's Lincoln County Lightning was one of my first introductions to white whiskey many years ago and I didn't really care for it at the time, but I wanted to break it back out and see if my tastes have changed... and they certainly have. I used to find this spirit overly corn-sweet and a little harsh on the palate with an alcohol-induced burning sensation. I guess I've gotten more and more used to that feeling as the corn sweetness is still there but overall this whiskey goes down smoothly. The burn is replaced with a honeysuckle and corn sweetness that drinks like mineral water. It's pretty amazing really how my tastes on this one have changed, so I'm damn glad that I went back to the well and gave it another try. An excellent start to my gameday morning, now #GEAUXTIGERS! Well, it has been a crazy week, but one thing I think almost everyone down here can agree on is that it's good to see some LSU football! My #wakeywhiskey tradition began as a gameday tradition, back in the Third Row Tailgaters days of glory. We would aim to get out to our tailgate spot by 7 AM, if not the night before. What better way to start the morning off than with a celebratory bourbon and coke? 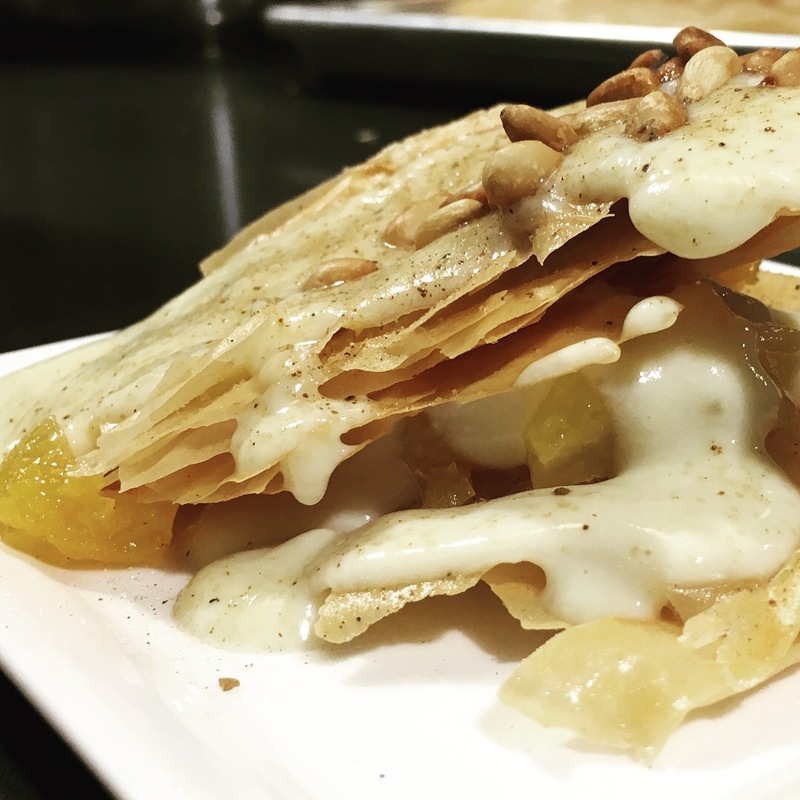 Tastes may have changed, but traditions haven't. 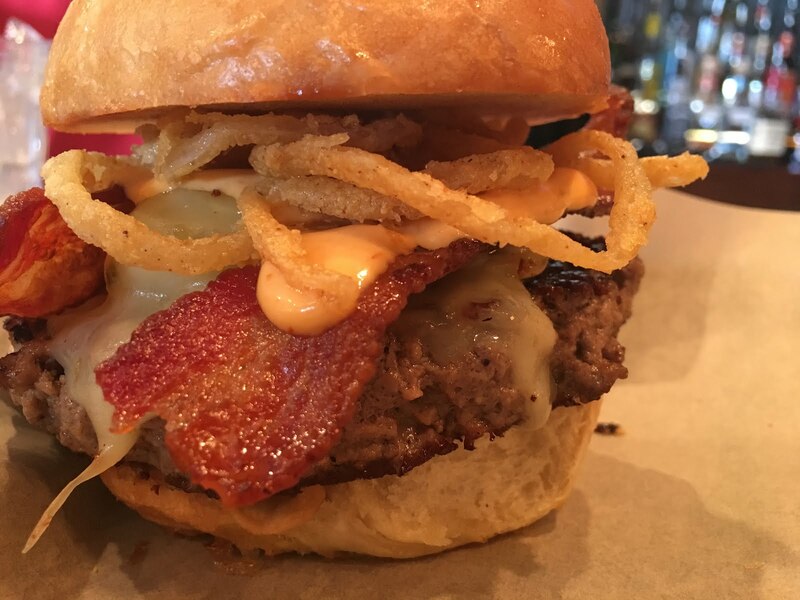 As football season rolls around, so does the wakey whiskey! As I'm sure you all know, Hurricane Harvey has made a mess of this last week, devastating the gulf coast from Corpus Christi up into South West Louisiana. The Bite and Booze and Gov't Taco team was hard at work Thursday night serving tacos and donating a portion of their proceeds to hurricane relief. In honor of the resilient nature of the gulf coast and of all the amazing people that have been doing their part to help, it was an easy choice to find a Texas bourbon for this morning's selection. I had a few to choose from, but ultimately I had to pull out the Outlaw Bourbon from Yellow Rose Distilling. 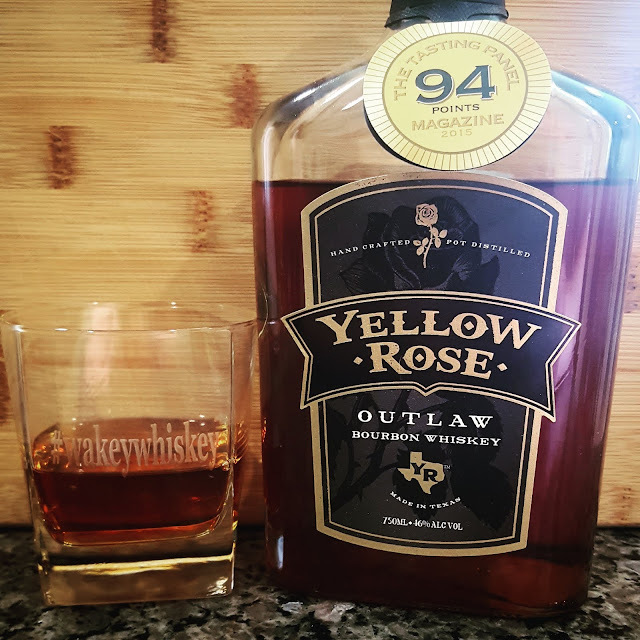 Yellow Rose was founded in 2010 and started hitting the market in 2012, making them Houston's first legal whiskey distillery. This bourbon is created in small batches from a 100% corn grain bill, then aged in small fresh charred oak barrels. The benefit of using the smaller barrels is that there is much more surface area per volume of whiskey, which serves to accelerate the aging process as the initially white (or clear) whiskey soaks in and out of the charred oak. The drawback is that more is typically lost to the "angel's share" than in a larger 55 gallon barrel. The accelerated aging process is evident, as the Outlaw Bourbon pours a deep reddish, almost copper color. The nose is strong with hints of vanilla and charred caramel. The taste is a superb follow through on the aroma, powerful with sweet corn notes, hints of vanilla, a touch of mineral water on the mouthfeel, and a slight burn from the alcohol without being a tough sip. This one clocks in at 46% alcohol or 92 proof, so it's a step above your standard 40%, but nowhere near as potent as some barrel proof bourbons on the market. The finish is smooth and that vanilla from the aroma comes back strong. All in all, a pretty damn good bourbon, absolutely worth looking for. On that note, stay strong Houston, and GEAUX TIGERS!